GREENVILLE — The beginning of summer always brings with it the excitement for vacations, outdoor activities and plenty of fun, but by midsummer, families start to run out of ideas and wonder if there’s anything left to do. There is. Just head downtown. Main Street Greenville has hit the halfway point of its 2015 schedule, but there is still plenty more to come. The year so far has included such activities as a petting zoo and scavenger hunt, spring planting, outdoor movies, lots of live music and truckloads of food. “It’s been a great season so far, and we’re ready for more,” Garrett said. Garrett said the downtown has seen a steady influx of visitors from out of town this year. “We’ve had a lot of visitors from all over,” Garrett said. Downtown Greenville shops carry a variety of clothing and gift items that can’t be found anywhere else, and of course, it’s also home to the famous KitchenAid Experience Retail Outlet. Bargain hunters and shoppers looking for something beyond the malls and discount outlets will pour into downtown for the annual Annie Oakley Sidewalk Sales July 23-25, corresponding with the Annie Oakley Festival. The festival will be at York Woods July 24-26 with the parade downtown, beginning at the fairgrounds and ending at the traffic circle. 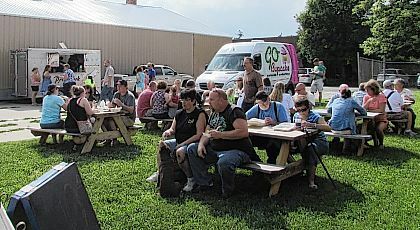 Aug. 7 will bring another popular Lunch on the Lawn, in partnership with the library. Lunch is 11:30 a.m. to 1 p.m. on the library lawn and will feature catered lunch by Romer’s for $7 and musical performance by Higgins Madewell. First Fridays continue Aug. 7 with the Artisan Stroll. In addition to the longer hours of many downtown businesses, local artists and artisans will sell their wares and demonstrate their talents from 6 to 9 p.m. The First Friday event Sept. 4 will have another popular Theatre on Third, with the screening to begin at dusk. The Downtown Greenville Farmers’ Market continues every Saturday from 9 a.m. to 1 p.m. through Oct. 10. For more on downtown activities and attractions, stop by the Main Street Greenville office at 421 S. Broadway St. or call 937-548-4998. For the latest updates, visit the website at www.mainstreetgreenville.org and follow Main Street Greenville on Facebook.